Harvesting and drying: Herb leaves should be cut when the plant’s essential oils are at their highest levels. Leafy herbs like basil, chervil, marjoram, lemon balm, parsley, rosemary and sage should be pruned just before blossoming time. Pruning or cutting should be done around noon, after the dew has dried. Try to choose a day that is hot and dry, with little humidity. It’s best to gather small bunches of herbs, and process them quickly. It’s easier to prepare the herb bunches or swags by working with only one or two different herbs at a time. Bunch or swag drying is an easy way to dry long-stemmed herbs. If the leaves are clean, it’s not necessary to rinse them off. Some of the herbs essential oils will be lost during the rinsing. If the leaves are dusty, coated with pollen or mulching materials, then rinse the herbs under cold water. A quick rinse at the sink with a sprayer works best. Tie the herbs in small bunches with twine, rubber bands or string and hang to dry. Careful that the swags or bunches do not touch. 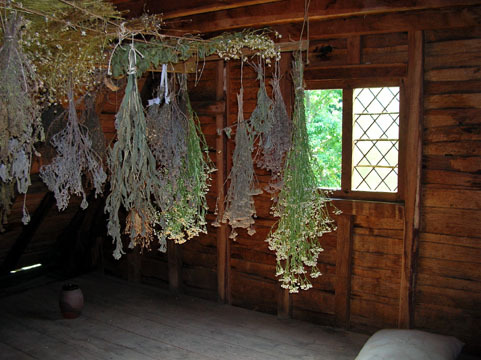 Air must flow over and around the drying herbs. Herbs dry best when left to hang leafy ends down so that the concentrated essential oils in the stems will flow into the leaves. Don’t hang the herbs in the kitchen to dry. It’s too hot and humid, and with strong cooking odors and steam, it could affect the flavor and aroma of the herbs. To prevent dust from collecting on the leaves, place each swag or bunch in paper bags to continue the drying process. Insert the herbs carefully inside the bags and close the tops with clothespins or paper clips. 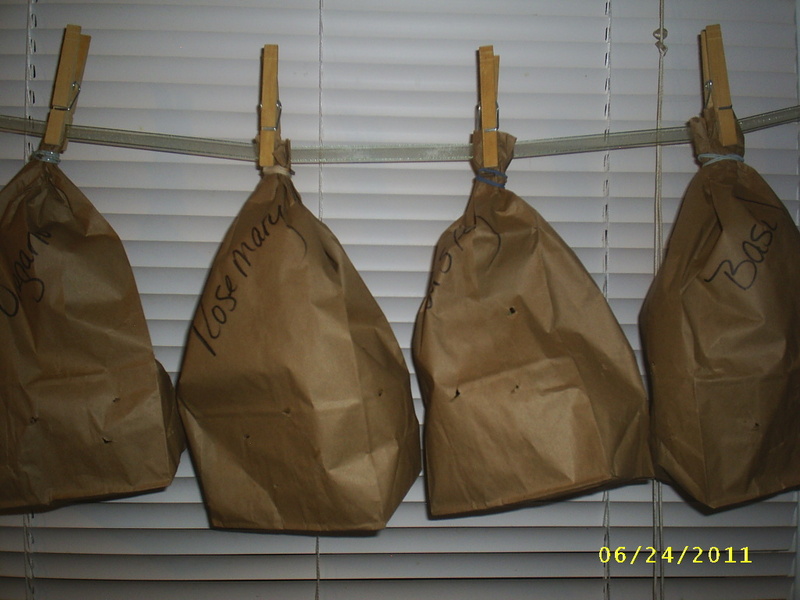 The leaves hang freely inside the bags, and because it’s paper, some air will enter the bags to allow for complete drying. This method of air drying takes 10-14 days depending on the type of herb, how thick the stems are, and the air temperature in the room. For example: I have lemon basil swags hanging from the drying racks, and even after ten days, they’re still moist in some areas, especially the stems. So be patient and don’t hurry the drying process. A small fan blowing away from the drying herbs will increase air circulation in the room. Aim for warmth, darkness and low humidity when choosing an area to air dry herbs. Happy 4th of July to our friends and visitors. Be safe and have a wonderful holiday. Blessed be ~ sweet ones. Can’t wait to try this process this year. First time saving our own herbs! It’s very easy to air dry herbs, and I think you’ll be pleased with the results.